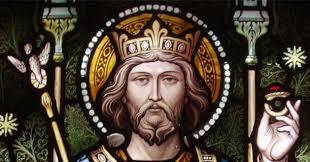 Edward was a prince, son of King Ethelred and Queen Emma. Edward and his brother were sent to Denmark to be “quietly killed”, but the officer in charge took pity on the boys and sent them to Sweden, and from there they went to the King of Hungary to be raised and educated. Edward finally returned to England in 1042 and was chosen king by acclamation. Edward gained a reputation as just and worthy of the kingship, and the people of England supported him. During his reign Edward fought invaders, restored the King of Scotland to his throne and disbanded unjust taxes. He was noted for his generosity to the poor and strangers and for his love of God.